China's consumer spending by households is only 35 percent of the nation’s G.D.P. ~ one of the lowest levels in the world. Its investment rate ~ nearly 50 percent of G.D.P is extraordinarily high. And the productivity of this investment is beyond dismal. 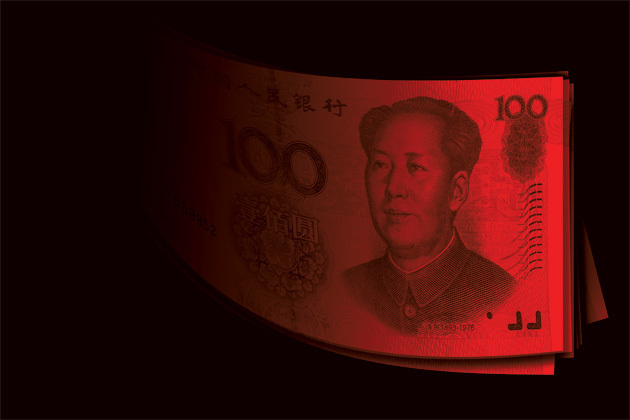 To a large extent, China's authoritarian command and control economic governance is to blame for its current financial peril. Limits on legal migration to cities promoted an underclass of illegal urban workers toiling for meager wages, slowing consumer spending and hindering urban development. State-owned monopolies plowed profits back into investment rather than into government spending on social welfare. Near-zero interest rates on deposit accounts provided cheap loans to business but penalized savers and the name of the game became to buy real estate ~ it's the mother of all mothers real estate bubble and its bursting at the seams. Further economic change in China will inevitably lead to political instability ~ which is not exactly the strongest incentive for government reform in China so it's time for China's leaders to circle the wagons and protect the authoritarian regime, regardless of the consequences to the people ~ for the Chinese Potemkin village of progress must be maintained or China will financially bring the world down with its immanent stock market collapse. It's the ultimate financial blackmail and it may just work for a short time ~ for it's also a con game operating on a worldwide basis. "An article published Sunday in the New York Times (“Investors Race To Escape Risk In Global Bonds”) sheds light on a significant factor behind the crisis atmosphere on global markets. The Times explains that some of the biggest bond mutual funds based in the US, including BlackRock, Franklin Templeton and Pimco, are massively invested in emerging market government bonds whose values are now collapsing. The article raises the very real possibility that one or more of these firms could be bankrupted by demands from investors for the return of their cash, under conditions where the firms cannot offload their emerging market bonds and meet these demands. Such an event would be comparable to, if not worse than, the collapse of Lehman Brothers in 2008. Following the 2008 Wall Street crash, the American ruling class led the way in using unlimited supplies of virtually free credit provided by central banks to push stock prices to record highs and generate an emerging market bubble, while laying siege to the jobs, wages and conditions of workers through mass unemployment and austerity policies. The resulting “recovery” had the character of a gigantic Ponzi scheme, resting on a stagnant real economy and ever-increasing social inequality. This financial house of cards is being undermined by the growth of deflationary tendencies in the world economy, reflected most starkly in collapsing commodity prices and the slowdown in China, but also in anemic growth or outright recession in Japan, Europe and the US." China's black hole of debt is now twice the size of its gross domestic product and it's fueling a Potemkin Village of potential growth. China’s total debt amounted to RMB 111.6 trillion ($18.3 trillion) at the end of 2012, which was 215.7 percent of that year’s GDP. Of this amount, corporate debt equaled 113.5 percent of GDP; government debt, 53.5 percent; household debt, 31.1 percent; and financial sector debt, 17.6 percent. This black hole of Chinese debt is clearly unsustainable, along with its ghost cities, but there is one person who clearly saw the hand writing on the wall in 2009 regarding China's dangerous debt excesses and his name is Jim Chanos. The was the founder of Kynikos Associates, a $3 billion hedge fund that specializes in short-selling, Chanos was the first person to figure out, some 15 years ago, that Enron was a house of cards ~ and now he reveals that China is also a huge house of cards on a massive international scale. "Chanos and his crew at Kynikos don’t make big “macro” bets on economies; their style is more “micro”: looking at the fundamentals of individual companies or sectors. And so it was with China. “I’ll never forget the day in 2009 when my real estate guy was giving me a presentation and he said that China had 5.6 billion square meters of real estate under development, half residential and half commercial,” Chanos told me the other day. The man replied that he hadn’t misspoken; it really was 5.6 billion square meters, which amounted to over 60 billion square feet. That insight soon led Chanos to make an audacious call ~ Short Chinese stocks. China was in the midst of an unsustainable credit bubble ~ witness the countless Chinese ghost cities fueled by nationwide false hope and manipulation. As it turns out, China’s economy began to slow right around the time Chanos first made his call. No matter: Most China experts remained bullish. Chanos, meanwhile, was shorting the stocks of a number of companies that depended on the Chinese market. And he was regularly sending out emails when he came upon articles that seemed to confirm his thesis: stories about newly constructed ghost cities and troubled banks and debt-laden state-owned enterprises." This loss of confidence has rightfully spooked stock markets around the world because we are all part of this world wide credit/debt scam and China's descent into this black hole of debt will have worldwide ramifications that will affect us all. "The world economy is like an ocean liner without lifeboats,” Stephen King, chief economist at HSBC, wrote in a recent research note. And this ocean liner has just hit a massive iceberg of debt and is sinking fast ~ and there are no lifeboats and that includes Quantitative Easing ~ An unconventional monetary policy in which a central bank purchases government securities or other securities out of thin air from the market in order to lower interest rates and increase the money supply. The Fed is now pumping annually approximately 1 to 2 trillion dollars out of thin air into the economy and that includes vast amount of Mortgage backed bonds and effectively putting a halter on Interest rates but at the same time piling up more debt ~ which now stands at 18 billion versus 6 billion in 2008. Every great con game or Ponzi scheme eventually comes to an end and it's always painful. The game is up and the day of reckoning is already here but the global elite will do everything in their power to indefinitely keep the Ponzi con game intact. The weakness in China is even compelling officials at the United States Federal Reserve to think more globally, as they consider raising interest rates. William C. Dudley, the president of the New York Fed, said on Wednesday that a September rate increase looked less compelling than it did a few weeks ago and China's economic blowback as well as credibility is the obvious unmentioned reason. The confusion and bankruptcy of governments and policymakers in the face of the renewed China downturn was summed up in a column published in the Financial Times over the weekend by former Treasury Secretary Lawrence Summers, who called on the Federal Reserve to keep interest rates at zero indefinitely. Summers wrote: “Satisfactory growth, if it can be achieved, requires very low interest rates that historically we have only seen during economic crises. This is why long-term bond markets are telling us that real interest rates are expected to be close to zero in the industrialized world over the next decade"
Summers, who has virtually no financial credibility, is also in denial for the die is cast and China's collapsing Debt vortex has already captured if not been inspired by the United States who has been playing the same con game as well as delaying the inevitable economic collapse. We stand at the precipice or the event horizon of the greatest economic transition that any of us have ever seen. China's black hole of debt has taken China beyond the point of no return and even though things may seem very “normal” to some people right now ~ the truth is that the global financial system is fundamentally flawed, and large cracks in the system are appearing throughout its infrastructure..
One thing is certain ~ when this economic Ponzi game does collapse, it will take most people entirely by surprise. But it shouldn’t for it has always been in plain sight for those willing to see beneath the surface as well as the Potemkin Chinese ghost cities without inhabitants.